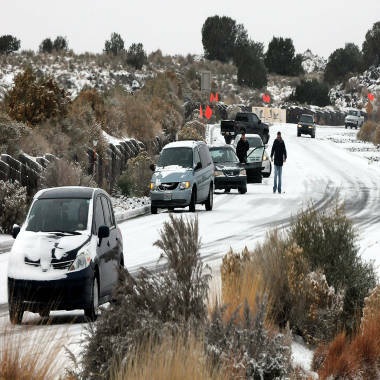 A winter storm system already has killed eight, while bringing snow to the southwest. Now, the system is making its way to northeast and could impact holiday travel severely. NBC's Miguel Almaguer reports. There's a chill in the air and snow headed to some parts of the country. What type of weather can you expect this Thanksgiving? Meteorologist Kim Cunningham reports. The storm, which started in the Southwest on Thursday, could affect a good chunk of the country by the time its westward march comes to an end. The inconveniently timed storm will especially be a concern for the 43 million people who are expected to travel 50 miles or more for the Thanksgiving holiday, according to AAA. Three million of those are slated to fly to their destinations, AAA predicted. The "Nordic outbreak" will "produce a mixed bag of wily weather that will end up impacting much of the nation," said National Weather Service meteorologist Joe Harris. More than a foot of snow was reported on Sunday in many mountain regions of Utah and Colorado, but the greatest accumulation reached almost four feet in Abajo Peak in southeast Utah, according to the Weather Channel. Even Flagstaff, Ariz. has seen 6 inches of snow since the storm started Thursday night, according to AZ Central. On Sunday, most of New Mexico and Texas and parts of Oklahoma were placed under National Weather Service winter storm warnings until Monday. A powerful storm system already has caused eight deaths and is headed eastward just in time to cause problems for holiday travelers. In New Mexico, forecasters predicted 5 inches of snow and temperatures as low as 20. The snow that began late Saturday, paired with the freezing temperatures, created dangerous driving conditions, and many roads were closed. New Mexico NBC affiliate KOB reported strong winds and near white-out conditions late Saturday night along a stretch of I-40, about 80 miles west of Albuquerque. The icy roads there led to a rollover accident that killed a 4-year-old girl, State Police Sergeant Emmanuel Gutierrez said. On Saturday, a storm-related crash involving nearly a dozen vehicles left three dead in the Texas Panhandle. In another ice-related car rollover, a fourth man was killed in the northern part of the state, State Trooper Chris Ray told NBC News. Four storm-related deaths occurred in Oklahoma, Betsy Randolph, Oklahoma Department of Public Safety spokesperson, told NBC News. Each died in separate vehicle crashes attributed to unsafe speeds on wet, icy or gravel roads, she said. Cars slide on Paseo del Norte Sunday, on Nov. 24, in Albuquerque, N.M., after a winter storm hit the region over the weekend. The large storm slogged through Oklahoma, Texas, New Mexico and other parts of the southwest Sunday as it slowly churned east ahead of Thanksgiving. Three more were killed due to the storm in California, where the storm first hit. A man was killed when he crashed his car into a tree and a woman was killed when a tree collapsed onto her parked car. A third person in California was found dead near power lines that were down due to heavy winds and flooding. Additional flooding in Arizona swept a man into the Santa Cruz River. Firefighters recovered his body on Friday. In all, officials blamed 13 deaths on the storm system, including four in Oklahoma, four in Texas, three in California and one each in Arizona and New Mexico. Three members of Willie Nelson’s band were injured when rain and high winds caused their bus to hit a bridge pillar in northeast Texas on Saturday, according to NBC Dallas Fort Worth. Elaine Schock, a spokeswoman for Nelson, told NBC DFW that no one suffered serious injuries, but the band’s remaining four November tour stops have been postponed. Over 11,000 people were without power on Sunday in the western part Texas, utility suppliers said. The wild weather system will spread east to Arkansas and northern Louisiana Sunday night into early Monday, according to the Weather Channel. From there, it will most likely bring heavy rain to the Southeast through Tuesday, according to Weather Channel meteorologist Dr. Tom Niziol. Heavy snow and high winds in New Mexico and Arizona, ice in Texas and low temperatures in Philadelphia are all part of a storm system moving across the country. The Weather Channel's Janel Klein and TODAY's Dylan Dreyer reports. The storm is expected to dump rain on areas from Atlanta to the Carolinas on Monday and Tuesday then turn to snowfall over Tennessee through West Virginia as it continues to progress Northeast on Wednesday, Niziol said. Conditions in the Northeast were largely dry Sunday, but the region experienced a cold blast that bought temperatures down to 10 degrees overnight — conditions “considered cold by January standards,” according to the National Weather Service. The region might see the second waves of the winter storm system on Wednesday, as many last minute travelers attempt to fly or drive long distances. "If the storm hugs the coast and develops to its full potential, it could be a flight nightmare, not only for travelers in the East, but also throughout the nation," AccuWeather.com COO Evan Myers said. A blast of cold air from the north could merge with the storm system from the south and lead to snow accumulation in western and northern New England, Pennsylvania and New York, according to the Weather Channel. In a second possibility, the two systems would not meet, but low pressure could produce snow in main northeast coastal cities. Whether the storm will continue to bring snow and ice or just rain to the Atlantic coast is hard to predict since a slight temperature fluctuation could determine the difference, said National Weather Service meteorologist Tom Bradshaw. Regardless, there is “certainly going to be a travel impact as we see the first few people making their way for Thanksgiving," he said. Already, more than 300 flights were cancelled on Saturday and Sunday at Dallas-Fort Worth International Airport. Whether or not travelers make it to their destinations, the storm will have moved out to sea by Thanksgiving Day, allowing for dry conditions across most of the country, according to the Weather Channel. Still, the Weather Channel predicts temperatures in the eastern part of the country will be 10 to 20 degrees below average on the holiday. But lingering Thursday morning wind gusts between 20 and 30 mph in the Northeast could have the potential to damper the Macy’s Thanksgiving Day Parade in New York City, according to AccuWeather.com. 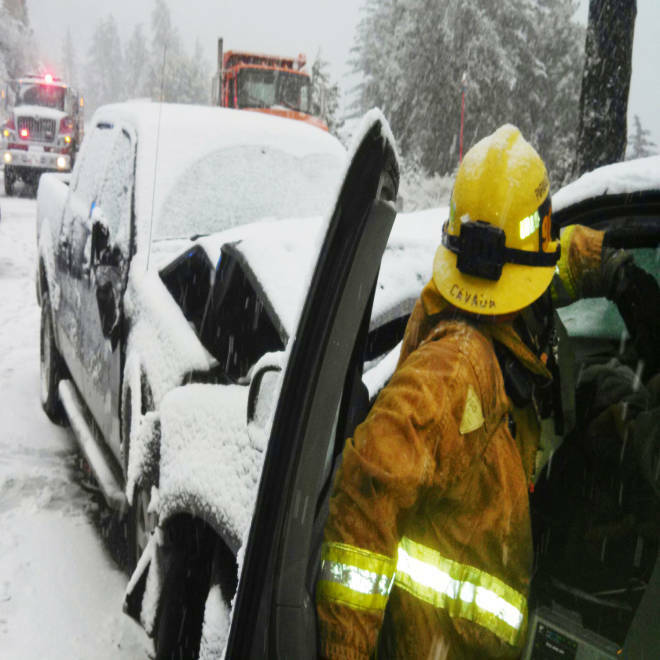 This image provided by the San Bernardino County Fire Department shows a traffic accident on Friday in the San Bernardino Mountains in California.